Amanda and John A. Foreman, Jr., tintype. 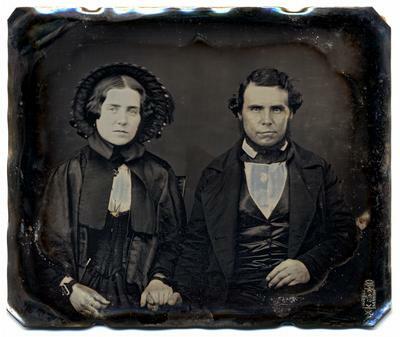 Date unknown but they married on April 29, 1847 in Oakville, Ontario and divorced in 1866, so sometime in these years. They had two children, Frances Mary and Charles Elmer. Other records in this group tell more about Amanda and John A.
Amanda Mary (Oakley), b. October 18, 1831, Waterdown, Ontario, d. October 10, 1869. John A. Foreman, Jr., b. January 9, 1825, Lewiston, New York, d. July 14, 1899.